Meanwhile, Island Bay's cargo of 5,500 tonnes of wheat, destined for flour mills in Libya, waited in the Ukrainian port of Berdyansk. The saga of the ship is a window on the leverage Moscow has over Ukraine's Azov seaboard, affecting dock workers, port operators, brokers and farmers who depend on the route. Russia, whose coast guards began inspecting traffic in the Kerch Strait eight months ago, blamed inclement weather for the delay. But on Sunday, when the skies cleared, just a handful of ships passed through; by Monday evening, the Island Bay's captain's frustration was beginning to show. "It is acceptable weather for transit. Coast guards have own opinion," his log, seen by Reuters, said. That day, he reported seeing just two ships cross into the Azov Sea. "Ship owners do not want to go to Berdyansk," said Rusin, whose clients include U.S. firm Cargill [CARG.UL], one of the world's largest dry bulk and tank shipping companies. "Buyers are refusing to bet on passage." "For us this was the worst week in recent years," Rusin said. "Clients have stopped considering the possibility of signing contracts for delivery in January, let alone February or spring," he said. Moscow says that idea is a fantasy dreamt up by Ukraine's pro-Western leaders ahead of elections next year. It says it has the right to patrol the strait. But Berdyansk's businesses say the patrols target ships bound for Ukraine, causing damaging delays. On its eleventh day at anchor in Kerch Strait, with skies finally clear, Island Bay reported to Berdyansk: "We called everywhere to make guards (come and) inspect the vessel, but their intentions cannot be explained." "We had expected to load around 150,000 tonnes over the next three months... Maybe 200,000," he said. Now the company is preparing for anything between 50,000 tonnes and no business at all, he said. "This was a change of plan that happened this week." The Azov Sea grain supply chain makes up just 2 to 3 percent of Ukraine's agricultural exports, deputy central bank chief Dmitry Sologub said. But for the southeastern Zaporozhye region, home to 1.8 million people, it is critical. 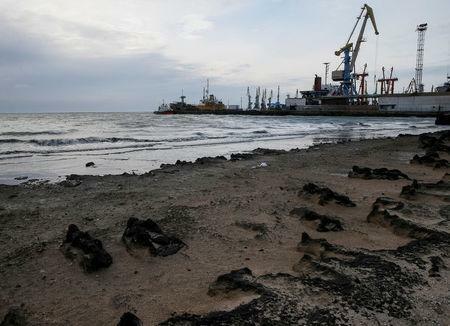 At the government Port Authority in Berdyansk, officials said they feared for the port's future as clients look to other locations with direct access to the Black Sea. "Of course we would prefer (to use other ports)," said Erdem Sekreter, fleet manager at Turkey's Bayraktar shipping group, which has two ships waiting to cross the Kerch Strait to reach the Ukrainian coast. "It is getting more expensive for ship-owners to go to the Azov Sea – the Ukrainian side of course," he added. "We are paying out of our pocket now." With ship-owners raising freight charges to factor in the new risks in the Azov Sea, the costs will be passed down to grain producers, Bison deputy director Igor Serov said. "It hits agricultural producers really hard." "Our sales have fallen," the Atria trader said. "It has affected us in a fundamental way." Every day Island Bay's cargo sits in port, it racks up costs for traders. Grain can spoil, and storage costs are steep. "The market is suffering... everyone along the chain is paying the price for these war games," a grain trader said, declining to be named due to the sensitivity of the situation. On Tuesday, Ukraine's agriculture ministry said some grain shipments from the Azov Sea had resumed. In comparison, of the ships aiming for one of Russian city Rostov-on-Don's ports, that had arrived to Kerch Strait since the stand-off began, none were still waiting for passage, the data showed the same day.